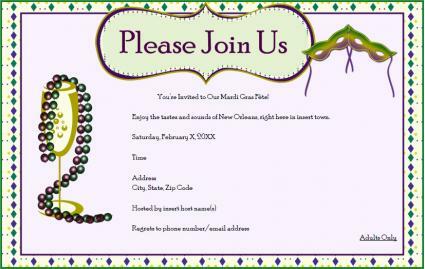 If you're hosting a party this Mardi Gras season, send out a fun invitation to spread the word to your guests. 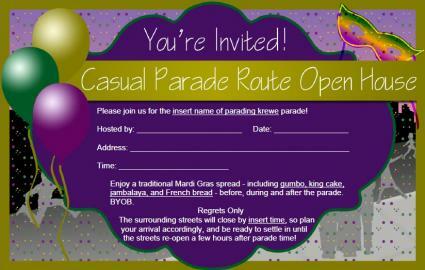 Whether you live along a parade route and want to invite friends to a viewing party or you simply want to host a get-together with a Mardi Gras theme, these free printable invitations offer a great way to spread the word. The invitations provided here are easy to customize for your own purposes. Simply click the image that you would like to use, and then click anywhere in the text area to change the information. When you're finished, click the diskette button to save, and then click the printer icon to print on the paper of your choice. Two invitations will print on each page. Use a paper cutter to separate them, and you'll have super-inexpensive custom invitations to use. If you need help downloading any of the printable invitations, check out these helpful tips. No matter where you live, Mardi Gras is a great excuse for a party! Use this catchy invitation to invite your circle of friends to share an evening of Carnival festivities and flavors at your home. Click to download this invitation. Mardi Gras isn't just for grown-ups. 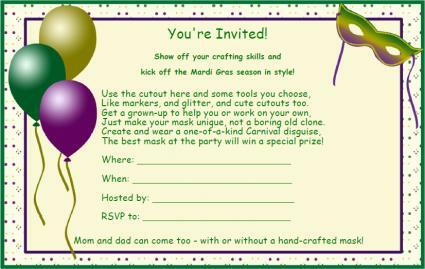 If you're allowing your child to throw a Mardi Gras party for his or her friends, this eye-catching invitation that promotes a fun, pre-party activity is sure to appeal to the invitees! Please note that you'll either need to use two sided printing or give each invite two slips of paper because of the activity. Click to download this invitation and activity. Parade viewing parties are a lot of fun! If you live along a parade route or have rented a hotel room along one, you might want to invite friends and family to a parade-viewing open house. This invitation will work perfectly for that purpose. Click to download a parade route open house invitation. 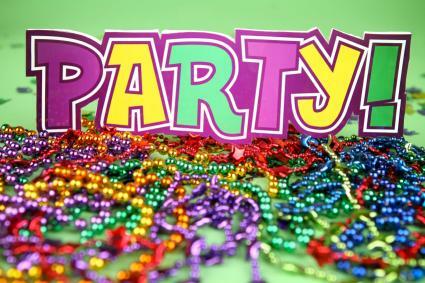 Let the good times roll this year, and throw an awesome Mardi Gras party. Just set the date, and let everyone know with the invitation of your choice. You'll be on your way to hosting an event to remember!